Thuja plicata, commonly called western redcedar or Pacific redcedar, giant arborvitae or western arborvitae, giant cedar, or shinglewood, is a species of Thuja, an evergreen coniferous tree in the cypress family Cupressaceae native to western North America. It is not a true cedar of the genus Cedrus. Thuja plicata is among the most widespread trees in the Pacific Northwest. It is associated with Douglas-fir and western hemlock in most places where it grows. It is found at the elevation range of sea level to a maximum of 2,290 m (7,510 ft) above sea level at Crater Lake in Oregon. In addition to growing in lush forests and mountainsides, western redcedar is also a riparian tree, growing in many forested swamps and streambanks in its range. The tree is shade-tolerant and able to reproduce under dense shade. It has been introduced to other temperate zones, including western Europe, Australia (at least as far north as Sydney), New Zealand, the eastern United States (at least as far north as Central New York), and higher elevations of Hawaii. The species is naturalized in Britain. Thuja plicata is a large to very large tree, ranging up to 65 to 70 m (213 to 230 ft) tall and 3 to 4 m (9.8 to 13.1 ft) in trunk diameter, exceptionally even larger. Trees growing in the open may have a crown that reaches the ground, whereas trees densely spaced together will exhibit a crown only at the top, where light can reach the leaves. It is long-lived; some individuals can live well over a thousand years, with the oldest verified being 1460 years. The foliage forms flat sprays with scale-like leaves in opposite pairs, with successive pairs at 90 degrees to each other. The foliage sprays are green above and green marked with whitish stomatal bands below; they are strongly aromatic, with a scent reminiscent of pineapple when crushed. The individual leaves are 1 to 4 mm (0.039 to 0.157 in) long and 1 to 2 mm (0.039 to 0.079 in) broad on most foliage sprays, but up to 12 mm (0.47 in) long on strong-growing lead shoots. The cones are slender, 10 to 18 mm (0.39 to 0.71 in) long, and 4 to 5 mm (0.16 to 0.20 in) broad, with 8 to 12 (rarely 14) thin, overlapping scales. They are green to yellow-green, ripening brown in fall about six months after pollination, and open at maturity to shed the seeds. The seeds are 4 to 5 mm long and 1 mm (0.039 in) broad, with a narrow papery wing down each side. The pollen cones are 3 to 4 mm (0.12 to 0.16 in) long, red or purple at first, and shed yellow pollen in spring. The bark is fibrous and longitudinally fissured. The leaves have white markings on the undersides of the flat foliage sprays. A shoot with pollen cones. Thuja plicata is one of two Thuja species native to North America, the other being Thuja occidentalis. The species name plicata derives from the Latin word plicāre and means "folded in plaits" or "braided," a reference to the pattern of its small leaves. Most authorities, both in Canada and the United States cite the English name in two words as western redcedar, or occasionally hyphenated as western red-cedar, to indicate it is not a true cedar (Cedrus), but it is also cited as western red cedar in some popular works. In the American horticultural trade, it is also known as the giant arborvitae, by comparison with arborvitae for its close relative Thuja occidentalis. Other names include giant redcedar, Pacific redcedar, shinglewood, British Columbia cedar, canoe cedar, and red cedar. Arborvitae comes from the Latin for "tree of life"; coincidentally, Native Americans of the West coast also address the species as "long life maker". One endonymous name for the tree is the Halkomelem word xepá:y, from the roots xíp, meaning "scratch" or "line", and á:y, "bark"; the former root may be in reference to both the lined or "folded/braided" appearance of the bark and the tree's ubiquity in carving and other forms of woodwork. The largest living specimen is the Cheewhat Giant, in Pacific Rim National Park Reserve on Vancouver Island, at 15,870 cubic feet (449 m3). The tallest known individual is the Willaby Creek Tree south of Lake Quinault, 195 feet (59 m) in height. 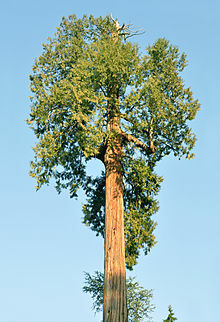 The "Quinault Lake Redcedar" was the largest western redcedar in the world. The "Quinault Lake Redcedar" was the largest known western redcedar in the world, with a wood volume of 17,650 cubic feet (500 m3). Located near the northwest shore of Lake Quinault north of Aberdeen, Washington, about 34 km (21 mi) from the Pacific Ocean, it was one-third the volume of the largest known tree, a giant sequoia named "General Sherman". The Quinault Lake Redcedar was 174 feet (53 m) tall with a diameter of 19.5 feet (5.9 m) at breast height. The "Quinault Lake Red Cedar" was destroyed by a series of storms in 2014 and 2016 and is now only a glorified stump. The fifth known largest was the Kalaloch Cedar in the Olympic National Park, at 12,370 cubic feet (350 m3), until it was destroyed by storm in March 2014. A redcedar over 71 m (233 ft) tall, 4.5 m (15 ft) in diameter, and over 700 years old stood in Cathedral Grove on Vancouver Island, British Columbia, before it was set on fire and destroyed by vandals in 1972. That tree now lies in "Giant's Grave", a self-dug 'grave' created by the force of its own impact. The soft red-brown timber has a tight, straight grain and few knots. It is valued for its distinct appearance, aroma, and its high natural resistance to decay, being extensively used for outdoor construction in the form of posts, decking, shingles, and siding. It is commonly used for the framing and longwood in lightweight sail boats and kayaks. In larger boats it is often used in sandwich construction between two layers of epoxy resin and/or fibreglass or similar products. Due to its light weight—390 to 400 kg/m3 (24 to 25 lb/cu ft) dried—it is about 30% lighter than common boat building woods, such as mahogany. For its weight it is quite strong but can be brittle. It glues well with epoxy resin or resorcinol adhesive. The wood typically used as an insect-repelling closet lining and to make cedar chests is a different species, Juniperus virginiana (also known as red cedar). Its light weight, strength, and dark, warm sound make it a popular choice for guitar soundboards. Like its relative Thuja occidentalis and many other conifer species, Thuja plicata is grown as an ornamental tree, and for screens and hedges, throughout the world in gardens and parks. A wide variety of forms, sizes, and colours is available. Thujaplicin, a chemical substance, is found in mature trees and serves as a natural fungicide, thereby preventing the wood from rotting. This effect lasts around a century even after the tree is felled. However, thujaplicin is only found in older trees. Saplings that do not produce the chemical often rot at an early stage, causing some trees to grow with a somewhat hollow, rotten trunk. It is also widely used throughout Europe and America for making beehive frames. 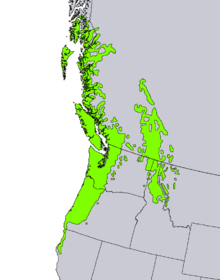 Western redcedar has an extensive history of use by Native Americans of coastal Oregon to southeast Alaska. Some northwest coast tribes refer to themselves as "people of the redcedar" because of their extensive dependence on the tree for basic materials. The wood has been used for constructing housing and totem poles, and crafted into many objects, including masks, utensils, boxes, boards, instruments, canoes, vessels, houses, and ceremonial objects. Western Red Cedar is also associated with a long tradition of curing and cooking fish over the open fire. Roots and bark are used for baskets, bowls, ropes, clothing, blankets, and rings. A huge number of archeological finds point to the continuous use of redcedar wood in native societies. Woodworking tools dating between 8000 and 5000 years ago, such as carved antlers, were discovered in shell middens at the Glenrose site, near Vancouver, British Columbia. In Yuquot, on the west coast of Vancouver Island, tools dating 4000 to 3000 years old have been found. The Musqueam site, also near Vancouver, yielded bark baskets woven in five different styles, along with ropes and ships dated to 3000 years ago. At Pitt River, adzes and baskets were dated around 2900 years aol. Wooden artifacts 1000 years old were unearthed on the east coast of Vancouver Island. Red cedar was used extensively wherever it was found along the northwest coast (British Columbia, Washington state, Parts of Alaska). Evidence of this use is found in CMTs (Culturally Modified Trees) that are found throughout the coast. When First Nations people removed the bark from cedars, it left a scar - which is considered a CMT. Other types of harvest (for planks, tinder, and other uses) leave different types of evidence of cultural modification. A legend amongst the Coast Salish peoples describes the origins of the western redcedar. In this legend, there was a generous man who gave the people whatever they needed. When the Great Spirit saw this, he declared that when the generous man died, a great redcedar tree will grow where he is buried, and that the cedar will be useful to all the people, providing its roots for baskets, bark for clothing, and wood for shelter. The wood was worked primarily with the adze, which was preferred over all other tools, even ones introduced by colonizers. Alexander Walker, an ensign on the fur trade ship Captain Cook, reported that the indigenous peoples used an elbow adze, which they valued over tools brought by the Europeans, such as the saw or the axe, going so far as to modify traded tools back into an adze. Tools were generally made from stone, bone, obsidian, or a harder wood such as hemlock. A variety of hand mauls, wedges, chisels, and knives are also used. Excavations done at Ozette, Washington turned up iron tools nearly 800 years old, far before European contact. When James Cook passed the area, he observed that almost all tools were made of iron. There has been speculation on the origin of these iron tools. Some theories include shipwrecks from East Asia or possible contact with iron-using cultures from Siberia, as hinted in the more advanced woodworking found in northern tribes such as the Tlingit. Harvesting redcedars required some ceremony and included propitiation of the tree's spirits as well as those of the surrounding trees. In particular, many people specifically requested the tree and its brethren not to fall or drop heavy branches on the harvester, a situation which is mentioned in a number of different stories of people who were not sufficiently careful. Some professional loggers of Native American descent have mentioned that they offer quiet or silent propitiations to trees which they fell, following in this tradition. Felling of large trees such as redcedar before the introduction of steel tools was a complex and time-consuming art. Typically the bark was removed around the base of the tree above the buttresses. Then some amount of cutting and splitting with stone adzes and mauls would be done, creating a wide triangular cut. The area above and below the cut would be covered with a mixture of wet moss and clay as a firebreak. Then the cut would be packed with tinder and small kindling and slowly burned. The process of cutting and burning would alternate until the tree was mostly penetrated through, and then careful tending of the fire would fell the tree in the best direction for handling. This process could take many days. Constant rotation of workers was involved to keep the fires burning through night and day, often in a remote and forbidding location. Once the tree was felled, the work had only just begun, as it then had to be stripped and dragged down to shore. If the tree was to become canoes, then it would often be divided into sections and worked into rough canoe shapes before transport. If it were to be used for a totem pole or building materials, it would be towed in the round to the village. Many trees are still felled in this traditional manner for use as totem poles and canoes, particularly by artists who feel that using modern tools is detrimental to the traditional spirit of the art. Non-traditionalists simply buy redcedar logs or lumber at mills or lumber yards, a practice that is commonly followed by most working in smaller sizes such as for masks and staves. Because felling required such an extraordinary amount of work, if only planks for housing were needed, these would be split from the living tree. The bark was stripped and saved, and two cuts were made at the ends of the planking. Then wedges would be pounded in along the sides and the planks slowly split off the side of the tree. Trees which have been so harvested are still visible in some places in the rainforest, with obvious chunks taken off of their sides. Such trees usually continue to grow perfectly well, since redcedar wood is resistant to decay. Planks are straightened by a variety of methods, including weighing them down with stones, lashing them together with rope, or forcing them between a line of stakes. Redcedar wood is used to make huge monoxyla canoes in which the men went out to high sea to harpoon whales and conduct trade. One of those canoes, a 38-foot (12 m) craft dug out about a century ago, was bought in 1901 by Captain John Voss, an adventurer. He gave her the name of Tilikum ("Relative" in Chinook jargon), rigged her, and led her in a hectic three-year voyage from British Columbia to London. Redcedar branches are very flexible and have good tensile strength. They were stripped and used as strong cords for fishing line, rope cores, twine, and other purposes where bark cord was not strong enough or might fray. Both the branches and bark rope have been replaced by modern fiber and nylon cordage among the aboriginal northwest coast peoples, though the bark is still in use for the other purposes mentioned above. At the right time of year, the bark is easily removed from live trees in long strips. It is harvested for use in making mats, rope and cordage, basketry, rain hats, clothing, and other soft goods. The harvesting of bark must be done with care, as stripping too much bark will kill the tree. To prevent this, the harvester usually only harvests from trees which have not been stripped before. After harvesting, the tree is not used for bark again, although it may later be felled for wood. Stripping bark is usually started with a series of cuts at the base of the tree above any buttresses, after which the bark is peeled upwards. To remove bark high up, a pair of platforms strung on rope around the tree are used and the harvester climbs by alternating between them for support. Since redcedars lose their lower branches as all tall trees do in the rainforest, the harvester may climb 10 m (33 ft) or more into the tree by this method. The harvested bark is folded and carried in backpacks. It can be stored for quite some time as mold does not grow on it, and is moistened before unfolding and working. It is then split lengthwise into the required width and woven or twisted into shape. Bark harvesting was mostly done by women, despite the danger of climbing 10 meters in the air, because they were the primary makers of bark goods. Today bark rope making is a lost art in many communities, although it is still practiced for decoration or art in a few places. Other uses of bark are still common for artistic or practical purposes. In recent years there has been a revival of cedar weaving in some communities, and along with it, new forms of cedar bark products. For example, in some recent weddings cedar roses are used to decorate the tables. Western red cedar is export-restricted in the United States under the Export Administration Regulations. Western red cedar is highly allergenic and woodworkers or loggers who work with it may have adverse reactions, including the development of occupational asthma, exacerbation of existing asthma, reduction of lung function, and eye irritation. Approximately 5% of workers are allergic to western red cedar. The US Occupational Safety and Health Administration has set a permissible exposure limit for red cedar dust of 2.5 mg/m3 as a time-weighted average over 8 hours. ^ A. Farjon (2013). "Thuja plicata". The IUCN Red List of Threatened Species. IUCN. 2013: e.T42263A2968155. doi:10.2305/IUCN.UK.2013-1.RLTS.T42263A2968155.en. Retrieved 15 January 2018. ^ a b "Thuja plicata". Natural Resources Conservation Service PLANTS Database. USDA. Retrieved 10 December 2015. ^ a b c d "Thuja plicata". Germplasm Resources Information Network (GRIN). Agricultural Research Service (ARS), United States Department of Agriculture (USDA). Retrieved 11 December 2017. ^ a b Minore, Don (1990). "Thuja plicata". In Burns, Russell M.; Honkala, Barbara H. (eds.). Conifers. Silvics of North America. Washington, D.C.: United States Forest Service (USFS), United States Department of Agriculture (USDA). 1 – via Southern Research Station (www.srs.fs.fed.us). ^ Stewart 1984, p. 21. ^ Priestman, Lauren. "Plant Description: Thuja plicata/Western Red Cedar". Northern Rockies Natural History Guide. University of Montana, Missoula. Retrieved 21 July 2013. ^ Flora of North America, p. 411. ^ Hill 1985, p. 103. ^ Skolmen, Roger G. "Natural Durability of Some Woods Used in Hawaii". Pacific Southwest Forest and Range Experiment Station. U.S. Forest Service. Retrieved 21 July 2013. ^ "Thuja plicata". Interactive Flora of Northwest Europe. ^ a b c d e f Earle, Christopher J., ed. (2018). "Thuja plicata". The Gymnosperm Database. ^ a b c d e Farjon 2005. ^ a b Stewart 1984, p. 24. ^ Tesky, Julie L. (1992). "Thuja plicata". Fire Effects Information System (FEIS). US Department of Agriculture (USDA), Forest Service (USFS), Rocky Mountain Research Station, Fire Sciences Laboratory – via https://www.feis-crs.org/feis/. ^ Flora of North America. ^ a b c Stewart 1984, p. 22. ^ Van Pelt 2001, p. 34. ^ Van Pelt 2001, p. 36. ^ Van Pelt 2001, p. 32. ^ Van Pelt 2001, p. 37. ^ Exotic Hikes, "Olympic National Park’s Kalaloch Cedar Destroyed by Storm"
^ Picture of the Cathedral Grove stump. ^ Chase, Jeri (Fall 2008). "Western Redcedar, "Tree of Life"" (PDF). Forests for Oregon. Oregon Department of Forestry. pp. 18–19. Retrieved 18 September 2014. ^ Bitner 2007, p. 424. ^ "RHS Plant Selector - Thuja plicata 'Atrovirens'". Retrieved 6 June 2013. ^ "RHS Plant Selector - Thuja plicata 'Aurea'". Retrieved 6 June 2013. ^ "RHS Plant Selector - Thuja plicata 'Stoneham Gold'". Retrieved 6 June 2013. ^ "RHS Plantfinder - Thuja plicata 'Whipcord'". Retrieved 23 December 2018. ^ Gardner 1963, p. 21. ^ Chedgy, Lim & Breuil 2009. ^ Stewart 1984, pp. 17–19. ^ Van Pelt 2001, p. 30. ^ a b c Stewart 1984, p. 27. ^ Stewart 1984, p. 26. ^ a b Stewart 1984, p. 36. ^ Pritzker 1998, p. 292. ^ Miller 2008, p. 67. ^ Stewart 1984, p. 39. ^ Stewart 1984, pp. 37–38. ^ Stewart 1984, p. 40. ^ Stewart 1984, p. 42. ^ Stewart 1984, p. 43. ^ McNeese 2002, p. 43. ^ Dill 2006, pp. 127–128. ^ Stewart 1984, p. 116. ^ Stewart 1984, p. 115. ^ Stewart 1984, p. 113. ^ "Wood Dust". OSHA/NIOSH. 28 September 2011. Chedgy, Russell J.; Lim, Young Woon & Breuil, Colette (2009). "Effects of leaching on fungal growth and decay of western redcedar (Thuja plicata)". Canadian Journal of Microbiology. 55 (5): 578–586. doi:10.1139/W08-161. PMID 19483786. Chambers, Kenton L. (1993). "Thuja plicata". In Flora of North America Editorial Committee (ed.). Flora of North America North of Mexico (FNA). 2. New York and Oxford – via eFloras.org, Missouri Botanical Garden, St. Louis, MO & Harvard University Herbaria, Cambridge, MA. Miller, Mike (2008). Alaska's Southeast: Touring the Inside Passage (11th ed.). Guilford, Connecticut: Globe Pequot Press. ISBN 0-7627-4535-5. ISSN 1545-1941. Pritzker, Barry M. (1998). Native Americans: An Encyclopedia of History, Culture, and Peoples. 1. Santa Barbara, California: ABC-CLIO. ISBN 0-87436-836-7. Van Pelt, Robert (2001). Forest Giants of the Pacific Coast. Global Forest Society and University of Washington Press. ISBN 0-295-98140-7. Zsolt Debreczy; Istvan Racz (2012). Kathy Musial (ed.). Conifers Around the World (1st ed.). DendroPress. p. 1089. ISBN 963-219-061-0.